Semi Permanent make up has gained massive popularity in recent years with many celebrities opting for the non surgical option to combat ageing and have the perfect makeup 24/7! The beauty of Semi Permanent Makeup is that it really is for women of all ages. It is the perfect way to enhance the natural look of your face and overall look. It is also a great alternative to minimizing the time spent each morning in your beauty routine and waking up with perfectly applied makeup, without having to constantly reapply throughout the day. In older women, Permanent Makeup can be used as a successful anti-ageing treatment without having to go under the scalpel. Sally Taha who has clinics in Durham, Sunderland and Newcastle, understands this and gives her undivided attention to develop the art of semi permanent makeup treatments to cheat the effects of the ageing process, taking into consideration the way the skin and facial features change over time and how these changes can be reduced. Eyebrows: Due to ageing the muscle tone decreases and the skin sags making your eyebrows sag and droop. Some women seek solace in surgical face lifts to lift the brows and give their face a more youthful appearance. However, expertly applied Hair Stroke Brows that ‘mimic’ individual brow hairs, in a shape that lifts the brows while complementing the natural bone structure of the face can be just as effectively used to make your eyebrows look great without the need or expense of surgery. Additionally, years of over-plucking means that hairs will often also be sparse, something that a face lift cannot treat. Eyeliner: Our eye appears to be sunken as we age, due to the fat from the eyelids sinking back into the eye sockets. 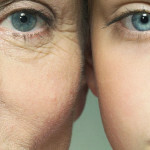 This is a direct result of bags developing under the eyes, creating the dreaded ‘crow’s feet’. The loss of elasticity in the skin makes eyelids droop, taking the attention away from the eyes, which is why the use of expertly applied eyeliner is essential. Unfortunately, applying eyeliner on a daily basis is cumbersome, making semi-permanent makeup an ideal, non-surgical procedure to deceive the effects of ageing and enhance and accentuate the eyes. Lips: Lips tend to become thinner, colourless and lose definition with aging due to the loss of collagen, a protein found in our skin. While fillers can be used, this alone is not enough for your lips to get the shape and definition that age has taken away from the lips. Semi Permanent Makeup creates the perfect lips, which are full, well defined and healthy, this alone is sufficient to give back the shape and definition that age has taken away from the lips while adding colour for further rejuvenation.